In this article we will see different formats supported by jQuery DatePicker. 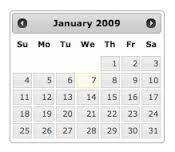 In the earlier examples we have seen how to render the datepicker on click of textbox and on click of button. jQuery DatePicker supports multiple dateformats. We will see how to change or apply different date formats. We are going to use this datepicker in MVC3 Razor project. We have created a ViewModel and defined DOB property which is of type DateTime. We will bind this property to the view to render control for this property. In the View, we have created a dropdown. We have populated dropdown with different date formats supported by jQuery DatePicker. On select of dropdown, we are applying the selected date format to the DatePicker. Select a date on clicking textbox. Then change the formats from dropdown to see date in different formats. On selecting date formats from the dropdown, we are applying the selected format to the datepicker. By this way we can apply date formats to datepicker.